January 9, 2001, SAN FRANCISCO -- Here it is Macworld Expo San Francisco again, and it's time for me to charge the batteries for the camera and get my best party clothes on for party coverage. Ah, such a hard job I have. This year, I have the pleasure of being joined by Lab Analyst Jason Cox, and I figure between the two of us, we will either successfully have ourselves kicked out of a party, or get enough information from some unsuspecting party attendee to make Steve Jobs angry, and I mean really angry. And of course, like last year, I will resurrect the seldom used "Steve Jobs-O-Meter" system of party ratings (OK, I made that name up for this year) -- basically, we rate parties on the likelihood that Steve would actually show up. Tonight on our dance card (do they still use that phrase?) we have Dantz, Adaptec, and a crash of a Microsoft party (no pun intended). The fun started at the Dantz Party, which is always the best of the bunch. Tonight, I was told by Dantz PR Guru Craig Isaacs that I would see Steve at the party, and upon arrival was told I "just missed him . . . in fact, he went that way." Of course, Craig was on to my Steve Jobs-O-Meter rating system, hoping I would rate his party higher. They needed no help. Held at Thirstybear restaurant for the second year in a row, the Dantz party featured some excellent food and a crowd that was as eager to talk as my 3-year-old nephew. (He just figured out how to form sentences and hasn't stopped talking since -- it runs in the family.) In fact, I overheard one developer claim that they were "sick and tired of Apple's 'everything is a mystery' crap they've been doing the past five years." I also spoke to an educator in the UC system who praised Apple's newest hardware release -- the Titanium PowerBook G4 -- but was really hoping for something smaller. He and I had an interesting conversation about OS X; me on the positive side of it, and he on the negative. 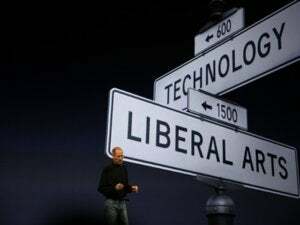 Even though he's a big fan of Unix, he didn't like the departure from the traditional Mac OS that Apple took with OS X. Of course, as I told him, these things seem to change. Other than a handful of things I managed to get people to say off the record (If someone wants to call Steve a taller version of Napoleon, they should feel free), the Dantz party was, as always, a wonderful event. The food was great (best yet), the crowd was ready to talk -- if not chasing me down to tell me something -- and the Steve Jobs-O-Meter rating was pretty high. A definite 5 out of 5. This year's shot-glass phrase was "iDrink, iDantz, iParty." This i thing is getting really old. There are 25 other letters in the alphabet -- perhaps we could see those before the name of an Apple product? zMac? sBook? uMovie? We wound up at the Microsoft party, conveniently held in the Microsoft SF store, which peddles every Microsoft product ever made (I swear I saw a copy of Windows 3.1 on the shelf). An odd place for a Macworld Expo party, considering their Mac section was limited to an iMac and an Office 2001 package. But hey, why not check out our alternative should this whole OS X thing not work out. After a photo or two, including one of a guy trying out a Windows CE device (not a color Newton, Sparky! ), and a woman who began speaking on a microphone -- I assumed her job was to encourage us to drink some kind of poison-laced beverage -- Jason and I agreed it was time to leave, and that running out would be the best method of transportation. Our final stop was the Adaptec Party, which had some kind of toast theme -- go figure. It was held at San Francisco's newest Sony Entertainment center, the Metreon. It was a nice event held in the private cyber-bowling alley, featuring food that would please anyone who wanted to suffer a heart attack. Never before have I seen so much butter and cheese per square inch in my life -- and my grandmother's from the South, where butter is a staple, not a spread. But, the food was good. By the time we made it to the party, it had slowed down, as had Jason and I. The blurry photo was an indicator it was time to head home. Steve Jobs-O-Meter reading at the Adaptec party? Right. After his comments at the keynote about toast -- doubtful. Unfortunately, we didn't manage to get tickets to the Apple party, but we didn't feel too bad because even people on Apple's staff couldn't go. The individual we met from Apple -- who shall remain nameless -- said "I work there, and I don't have a ticket" when we asked about getting two. Oh well, I'm not a big fan of Third Eye Blind. JASON COX attended the parties with BRETT LARSON, and the two recently produced a Pre-Expo documentary on waiting in line for Tuesday's keynote speech. The Dantz party lacked the live presence of Steve Jobs, but had ample revelers and some festive lights.Two Microsoft party attendees take a break from the action to sample the handhe When you have problems focusing the camera -- as Brett did at the Adaptec party -- it's time to hang up the dancing shoes and head home.